A series of maps have been published illustrating the most deadly places in America. The data may look spectacular laid out in colorful graphics, but they clearly identify the deadly effects of Mother Nature. The maps were created by John Nelson, a UX & Mapping manager at IDV Solutions and were reported by the Business Insider. 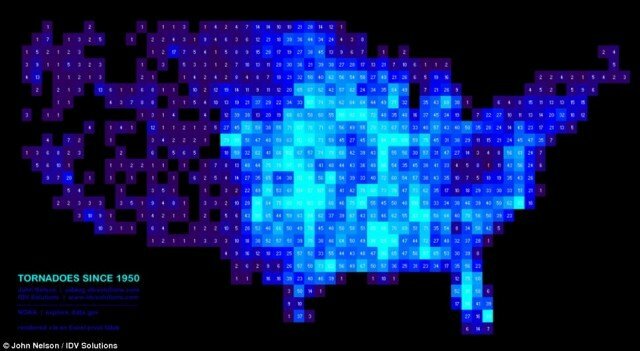 Using a spreadsheet he converted the data into a pixelated map of the U.S which created the spectacular graphics. After plotting the data John Nelson was able to create charts which show the most disaster-prone areas across America. A spectacular blue graphic shows a history of hurricanes across the U.S. since 1851. Another blue map shows earthquakes across American since 1968, clearly showing which regions are more susceptible to movement. 75 per cent of all tornadoes on Earth occur in the U.S. and John Nelson used the data to construct a vivid electric blue map of tornadoes. He detailed where they had occurred since 1950 – the most recent was the terrifying tornado was devastated parts of Oklahoma and killed 22 people. A bright orange map details wildfires across the contagious U.S. since 2001. This month the US forest service chief says hotter, drier conditions mean wildfire season lasts two months longer than it did 40 years ago. Rain is currently helping firefighters douse Colorado’s most destructive wildfire in state history, while a new wind-whipped blaze in California is forcing evacuations and threatened homes near Yosemite National Park. The release of the maps come as U.S. mayors pledged this week to make their communities more resilient to increasingly severe floods, droughts, extreme storms and wildfires, which they said was more efficient and cost-effective than disaster clean-up afterwards. Four dozen elected officials, from localities as diverse as Washington D.C., Des Moines, Iowa and Santa Barbara County, California, released a one-page plan which laid out actions such as using more renewable energy and making buildings and infrastructure more energy-efficient. The Resilient Communities for America Agreement was launched less than a week after New York Mayor Michael Bloomberg announced a $20 billion plan to prepare his city for rising sea levels and hotter summers. The actions by local officials took place as anticipation builds that the White House is planning a series of executive actions in July to address climate. Federal action can help, but local officials are at the front lines of natural disasters, said Des Moines Mayor Frank Cownie. Iowa’s biggest city saw severe flooding in 2008, a trio of ‘500-year’ floods in 2010, a drought in 2012 and the wettest year in 140 years of record-keeping so far in 2013. “These extreme events are becoming more and more prevalent, and local government is really where it happens,” Frank Cownie said. He said Federal Emergency Management Agency (FEMA) personnel sometimes are not on the scene until days after disaster strikes, when local officials have already gone ahead with recovery efforts without waiting for federal approval. “When they show up, it’s good; they’ve got those T-shirts on with FEMA on the back, but they’re just taking notes … We need decision-makers in the throes of an event and we need them immediately,” Frank Cownie said. El Paso Mayor John Cook said his desert city has been bombarded by wild weather since he took office: Three years’ worth of rain arrived in one week in 2006, causing some $450 million in damage, while in 2011, El Paso’s normally warm weather snapped cold, with temperatures below those of Anchorage, Alaska, for five days, straining local gas lines. El Paso has spent $100 million to make its buildings more efficient, installing solar panels on library roofs and improving mass transit, with buses that run on compressed natural gas, to cut down on fossil-fueled vehicle traffic. “The state of Texas should hang their head in shame,” John Cook said.